When the Emancipation Proclamation was signed in 1863, the black community owned less than 1 percent of the United States' total wealth. More than 150 years later, that number has barely budged. The Color of Money pursues the persistence of this racial wealth gap by focusing on the generators of wealth in the black community: black banks. By studying the conduct and policies of these institutions over time, Mehrsa Baradaran challenges the myth that black communities could ever accumulate wealth in a segregated economy. 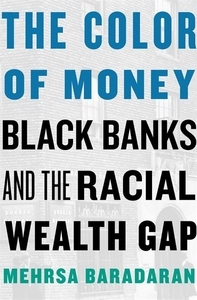 "Extraordinary... Baradaran focuses on a part of the American story that's often ignored: the way African Americans were locked out of the financial engines that create wealth in America, and the way the rhetoric of equal treatment under the law was weaponized, as soon as slavery ended, against efforts to achieve economic equality."